With implants from our Thornton, CO dental office, you can avoid the complications that come with tooth loss and enjoy a beautiful, functional smile. Dental implants provide a permanent way to replace any number of missing teeth for greatly improved appearance and oral health. Don’t live with gaps in your smile caused by tooth loss. Call our dental implant provider today to learn more about how we can help! Teeth can fail or fall out entirely for any number of reasons, from injury to tooth decay or damage. 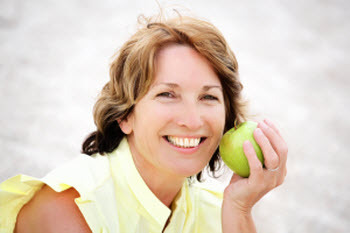 Regardless of what caused the need for extraction or the issues that compromised your oral health, dental implants successfully restore your smile, and many patients are a candidate for this beneficial procedure. Dental implants act as complete replacements for missing teeth; they restore both the tooth root and the visible part of your tooth above the gum line. The body of the implant looks like a metal screw and is placed through oral surgery into the jawbone. At Alpine Dental Center, Dr. Gurman provides natural-looking restorations to create a natural-looking and beautiful new smile. Dental implants provide a long-lasting alternative to other restorative treatments, and are perfect for replacing a single missing tooth, or even correcting sporadic tooth loss – where single teeth are missing from various spots in your smile. As implants become a permanent part of your dental anatomy, they are intended to last a lifetime. This lowers patients’ ongoing costs to maintain their prosthetics. While traditional bridges and partials may need to be replaced entirely at some point, the only part of your implant that would require restoration is the attached crown. In a long-term cost analysis, dental implants prove to be a cost-smart and health-smart decision that improves patients’ well-being. Don’t struggle with missing teeth or uncomfortable dental prosthetics. Schedule with Alpine Dental Center and learn more about getting dental implants in Thornton, CO.